The Palmer Report on the 2010 Gaza flotilla raid by IDF commandos concludes Israel's blockade is legal, but castigates IDF tactics. An advanced copy of the UN Palmer Report - to be released Friday - concludes Israel's naval blockade of Gaza is legal and appropriate, but insists the tactics employed when IDF naval commandoes boarded the infamous Mavi Marmara flagship were "excessive and unreasonable." The 105-page report, obtained by the New York Times, was completed months ago, but its publication was delayed several times as Turkey and Israel sought to mend relations and avoid making the report public. Reactions from both governments contained in the report objected to its conclusions. 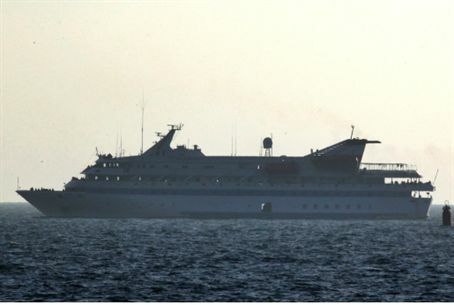 Turkey is particularly angry over the conclusion Israel’s naval blockade is in keeping with international law and that its forces have the right to stop Gaza-bound ships in international waters, which is what transpired with the Mavi Marmara. Turkey argues such a conclusion oversteps the mandate of the four-member panel and is at odds with other United Nations decisions. Regarding the boarding action itself, the Palmer committee said Israel should have issued warnings closer to the moment of action and should have first turned to nonviolent options – utterly ignoring that the commandos who boarded the vessel were armed with less-than-lethal 'pneumatic guns' and that 'live fire' was only employed when those proved insufficient to stop the threat to life and limb they faced. The report also assailed Israel for the way in which the nine were killed and others injured. “Forensic evidence showing that most of the deceased were shot multiple times, including in the back, or at close range has not been adequately accounted for in the material presented by Israel,” it says. The report does, however, acknowledge that once on board the commandos faced “organized and violent resistance from a group of passengers” that required they defend themselves against violent attack. The report also criticizes Israel’s subsequent treatment of passengers, saying it “included physical mistreatment, harassment and intimidation, unjustified confiscation of belongings and the denial of timely consular assistance" – a hotly contested allegation never independently verified and unsupported by corroborating evidence. Prime Minister Recep Tayyip Erdogan of Turkey says an apology - a step beyond an 'expression of regret' - and compensation would not be sufficient to return his ambassador to Tel Aviv - insisting Israel also terminate its blockade on Gaze despite the report’s conclusions. So strident have Turkey's demands come that on the eve of the report’s release it has issued an 24-hour deadline for a 'full apology' from Israel, but Prime Minister Binyamin Netanyahu has rejected any such notion saying it would demoralize the nation and be taken as a sign of weakness. The report noted that the panel did not have the power to compel testimony or demand documents, only had what Israel and Turkey provided, and that its conclusions are not definitive in either fact or law.